In the summer of 2014 the Central Long Island Surfrider Foundation Chapter began tabling all events with a petition to gauge local interest in getting rid of plastic bags, while a local artist and activist Amanda Moore ran community activities to educate the public about the plastic pollution issues plaguing our oceans, even producing several reusable bags designed by young children and sold in farmers markets. 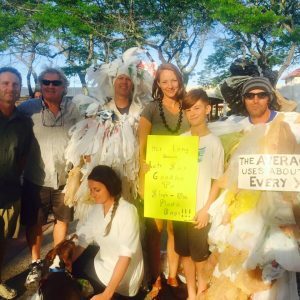 In July of 2015, Surfrider activists paired up with environmental organization All Our Energy and the Sierra Club as well as a strong team of local volunteers to form an official campaign dubbed Byobaglb. This coalition has worked hard to capture 1000’s of petitions signatures, secure support from dozens of local businesses, host Bag It screenings all over town, create an alliance with the local Chamber of Commerce, get the City Council on board and relentlessly push the message of why Long Beach needs to #riseaboveplastics. Chapter volunteer Amanda Moore has spearheaded these efforts for Surfrider both through her Executive Committee post and with other members of Long Beach’s Environmental Advisory Board, also strong advocates of the bag bill. A successful rally on July 19th, 2016 organized by the Byobaglb coalition propelled the movement into the public eye even further and pressure mounted on the City to finalize a draft of the legislation. Council Members Moore, Eramo, Goggin and Adelman have been quite active in seeing this through. On October 5th, 2016 the City Council published the resolution in a routine Council meeting and the ordinance is up for a public hearing and vote on October 18th, 2016. The bill mimics both the recently passed Suffolk County and NYC bills and will impose a 5 cent fee on all types of checkout bags to encourage residents to bring their own bags, making a huge reduction in the 11 million or more plastic bags used in Long Beach every year. Present in the debris collected at every cleanup Surfrider has organized, it will be awesome to finally say bye-bye to these bags!! !